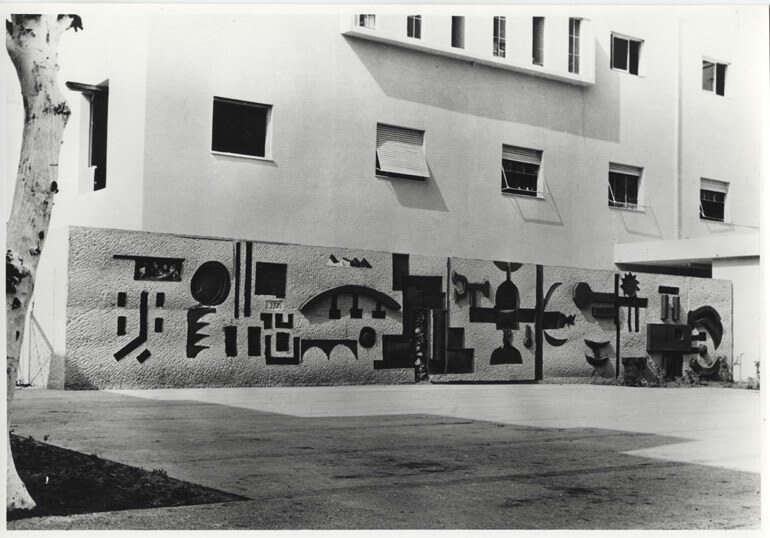 Architectural art commissions undertaken by Azaz in Israel, Europe, North America and Africa 1957 – 1992. These works include sculptures in a variety of cast and wrought metals; poured and carved concrete; carved woods and stained-glass windows. 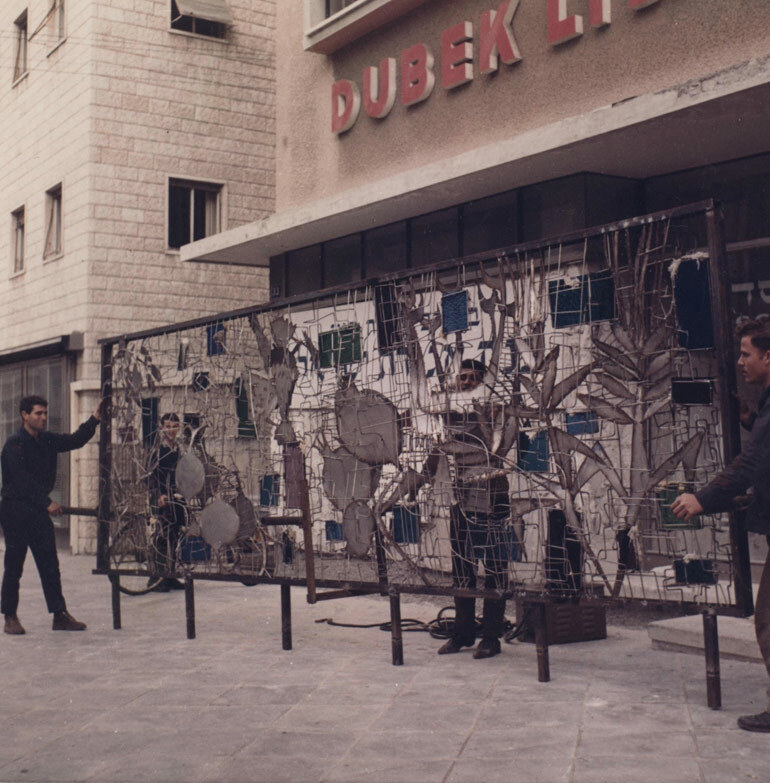 Smaller pieces were created in Azaz’s studios and then shipped to the installation site, while larger structures were carved on site or pre-cast in local factories and forges. Wall for restaurant, made from fired brick materials taken from local brick factory Chasin Esh. 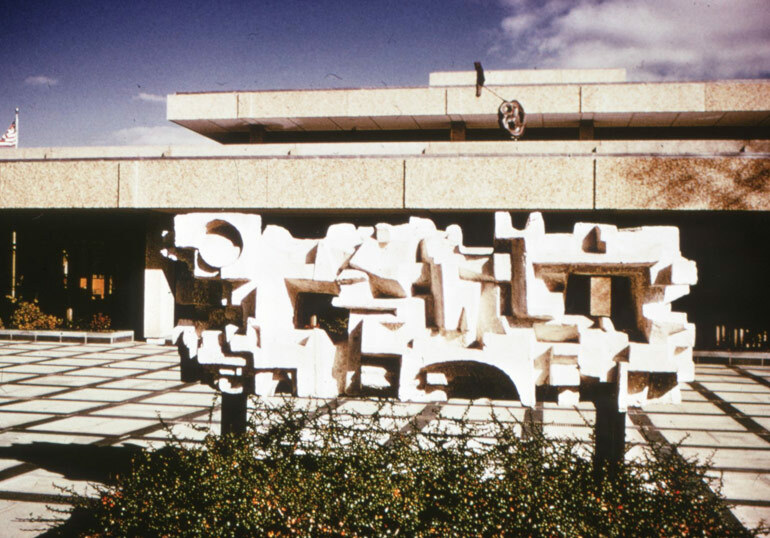 The artwork remains in its original location. Evening News Offices, Tel-Aviv, Israel. CERAMIC DECORATIONS Glazed refectory tiles on elevation Yedioth Ahronoth (Evening News) publishing house. The artwork has been removed or covered over. 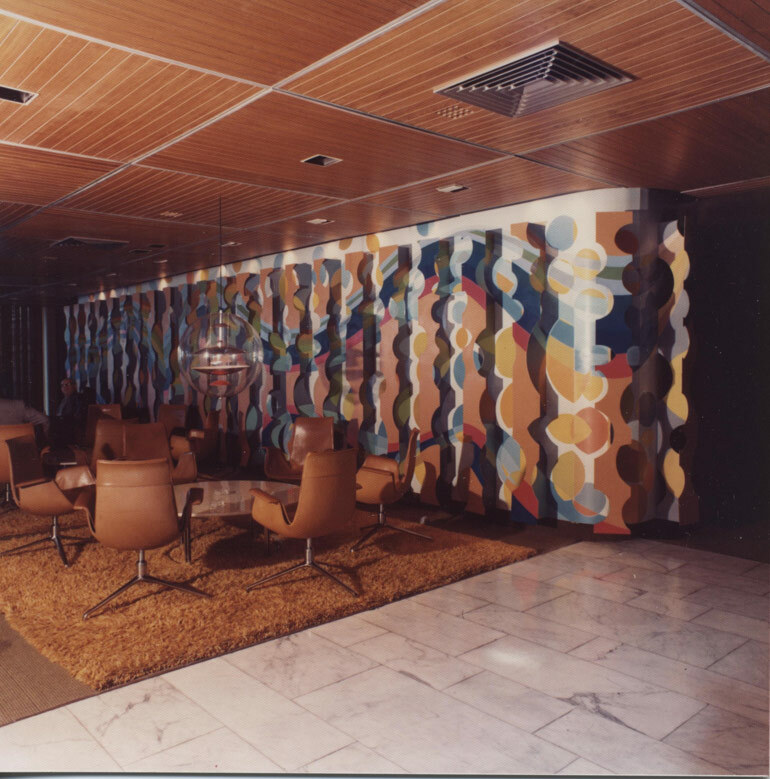 Double-sided concrete wall for the lobby of Sheraton Hotel, Te-Aviv. 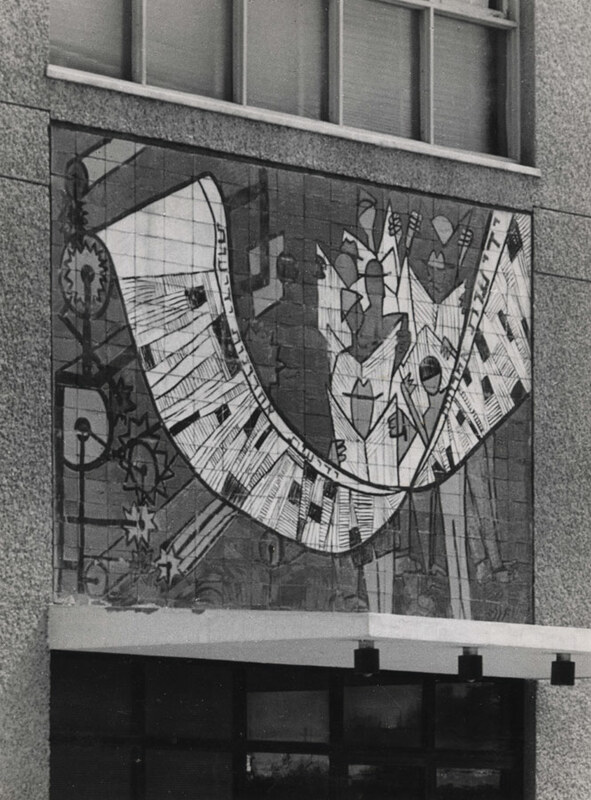 The building, together with the artwork, was demolished in 1990. 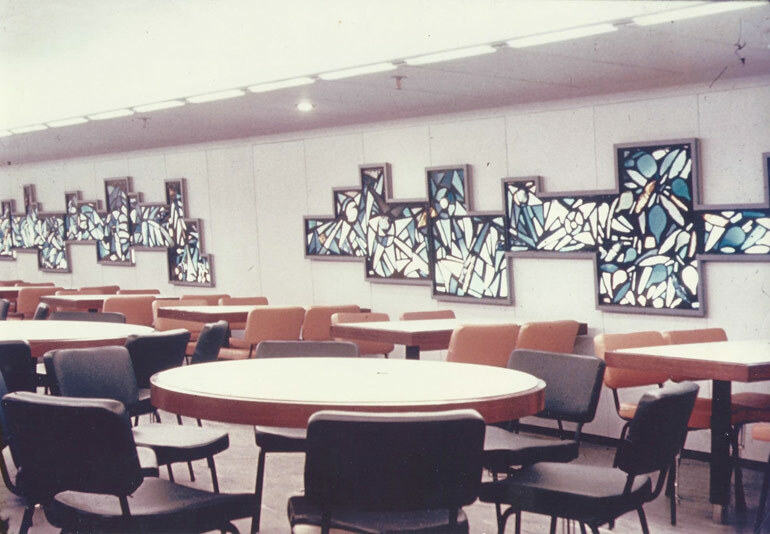 Stained glass windows for main dining hall. 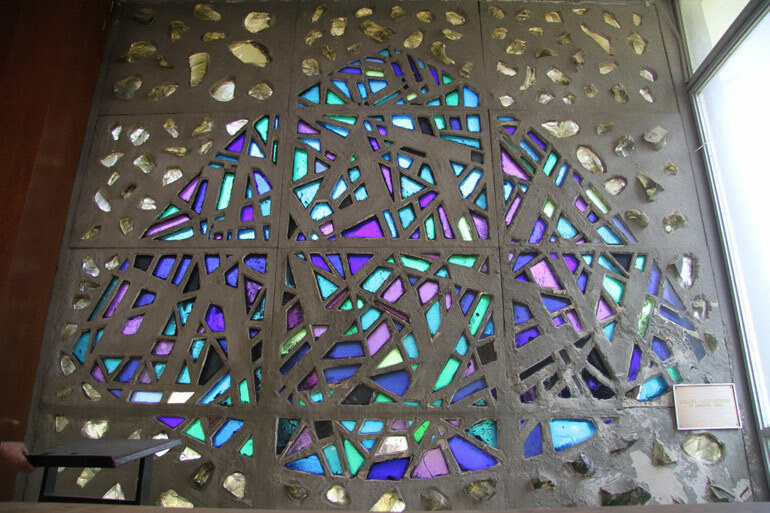 Stained glass panels 4 x 7.5 metres long and 30 metres in total, thin sheet and chunk coloured glass set in black epoxy, fiberglass reinforced both for light weight and vibrations of motors. The ship sank in 1988. Architects and Engineers Assoc. Building, Tel-Aviv, Israel. 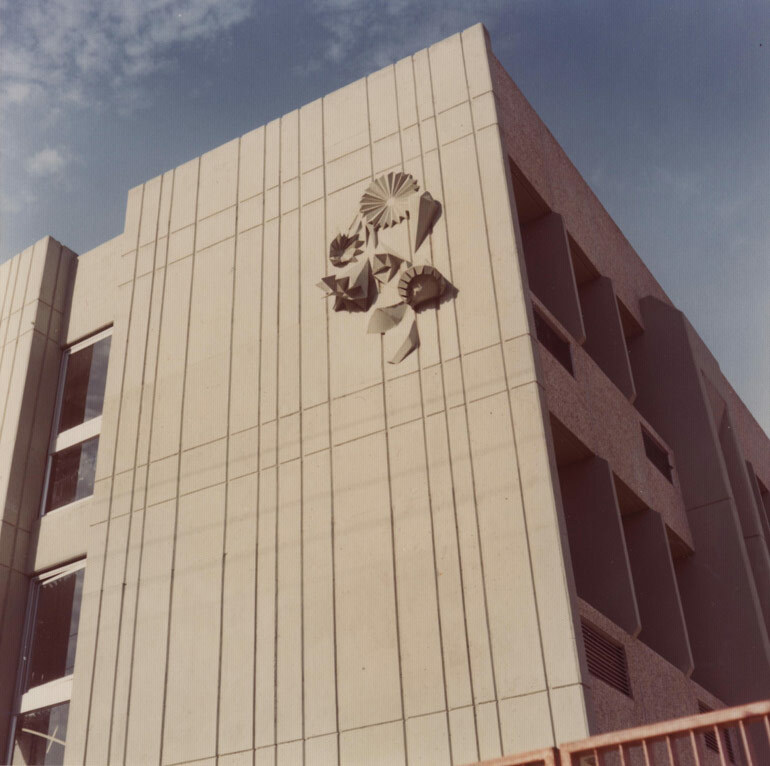 Cast and carved concrete wall. The site has undergone changes to the exterior which largely mask the artwork; however parts are still visible. Kfar Silver Agricultural College, Ashkelon, Israel. Concrete and chunk glass wall. Stylised script of from Proverbs 28 (עובד אדמתו ישבע לחם - He who tills the land shall have plenty of food) and Psalm 23 (ה' רועי לא אחסר - The Lord is my Shepherd, I shall not want) is part of the motif of these windows. 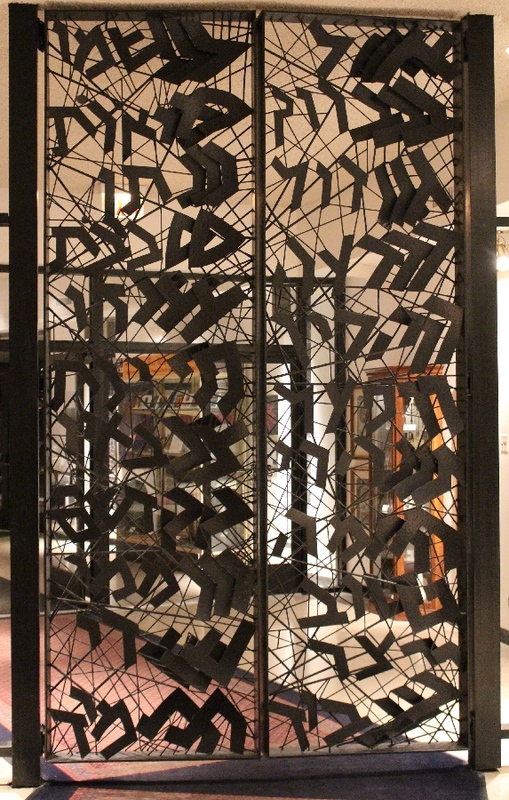 Rissman Kol Ami Museum - North Suburban Synagogue Beth El, Highland Park, IL, USA. Bronze sculpture over main entrance door. Bronze Ark doors with lettering. Carmel College, Wallingford, OXON, UK. The Eastern windows were storm damaged in 1987. Azaz remade the windows from new designs and a different glass technique. Carmel College closed in 1997. The synagogue is a grade 2 listed building with both the newer Eastern windows and the original front windows remaining in situ. Mony Tower I, Syracuse N.Y, USA. 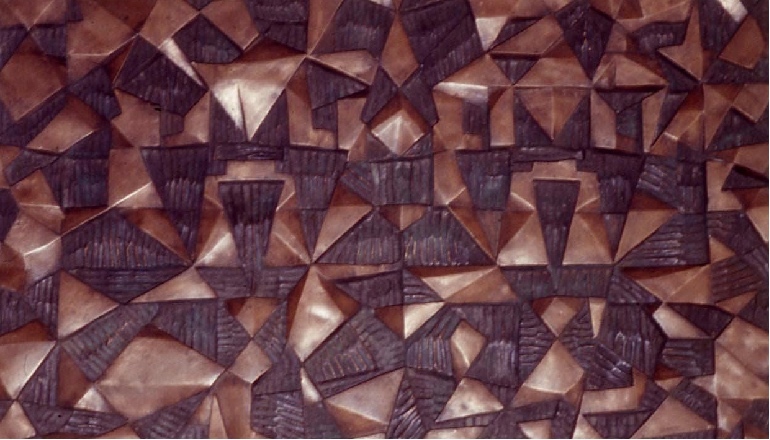 Bronze surface, fiberglass resin, wall relief. Original motif carved as wood maquette. 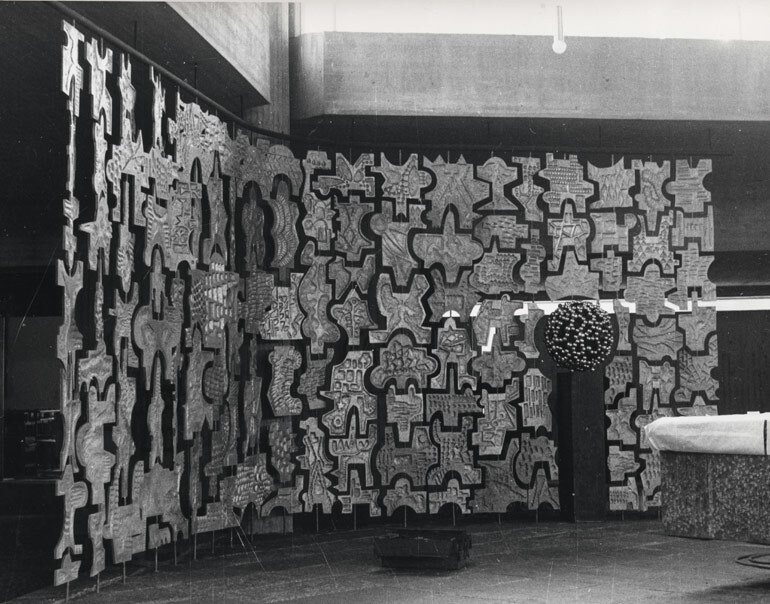 A number of individual panels were made at the same time and can be found in private collections. We would welcome information about the current location of this artwork. Stainless steel screen dividing public counter from tellers in bank, Installed April 1965. Length of screen 36“x 6‘6“, The figures on the screen are stylized symbols on Israeli coins.“ Written on back of photo by Azaz. We would welcome information about the location of this artwork. CIBA Pharmaceutical Building, Summit, N.J, USA. Image credit: Louis Checkman, Box 7042, Jersey City, N.J. 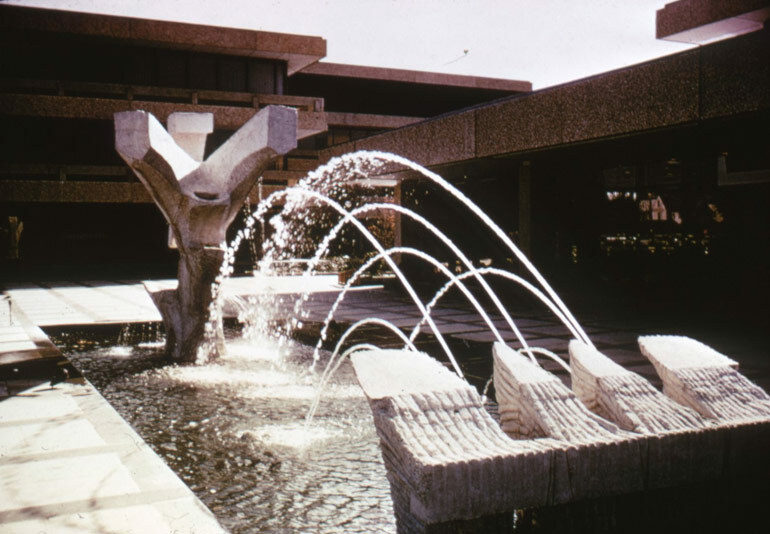 Cast white concrete fountain. We believe that the artwork no longer exists but would welcome information about this. 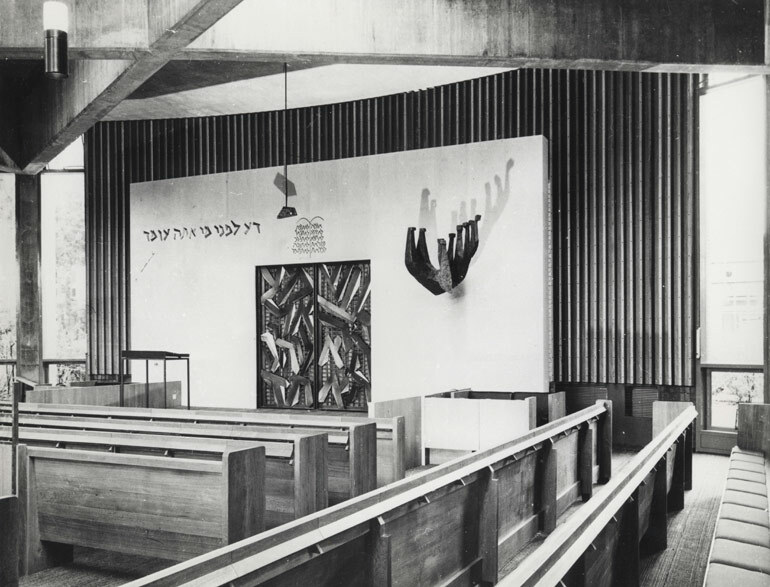 Belfast Synagogue, Belfast, Northern Ireland, UK. East Wall and Ark doors in bronze and silver, and Candelabra and Eternal Light. 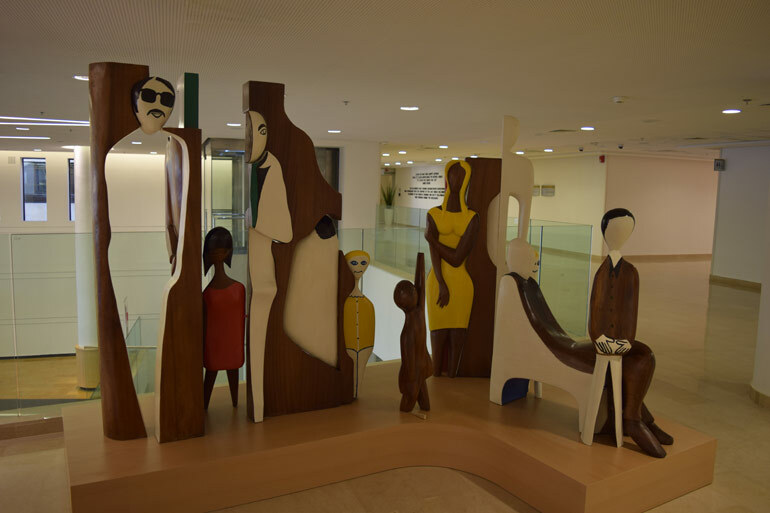 The artworks remain in their original location. Original candelabra maquette by Azaz in metal. 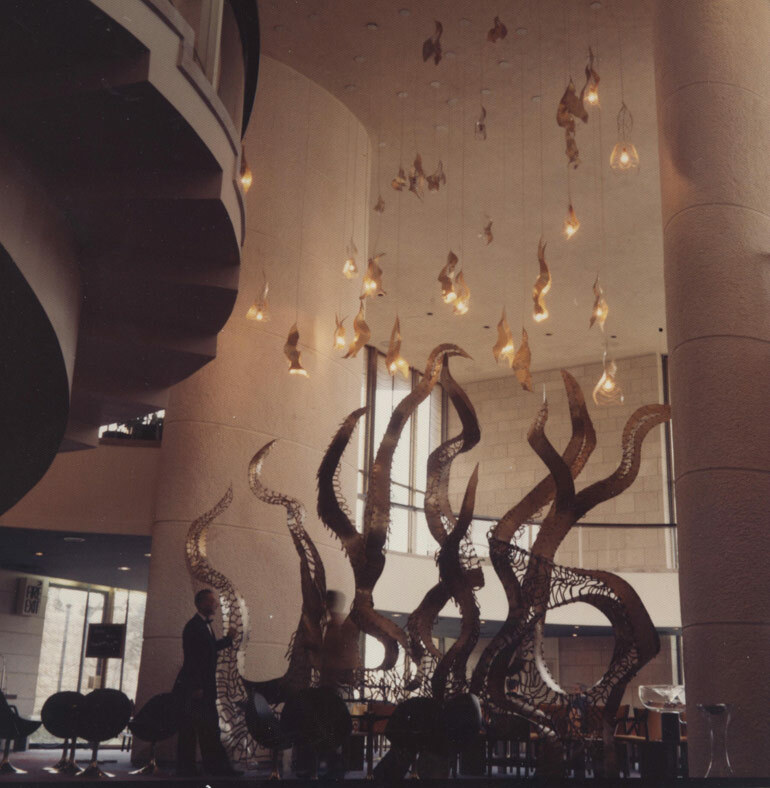 The artwork was disassembled during hotel renovations. Marble Arch Synagogue, London, UK. 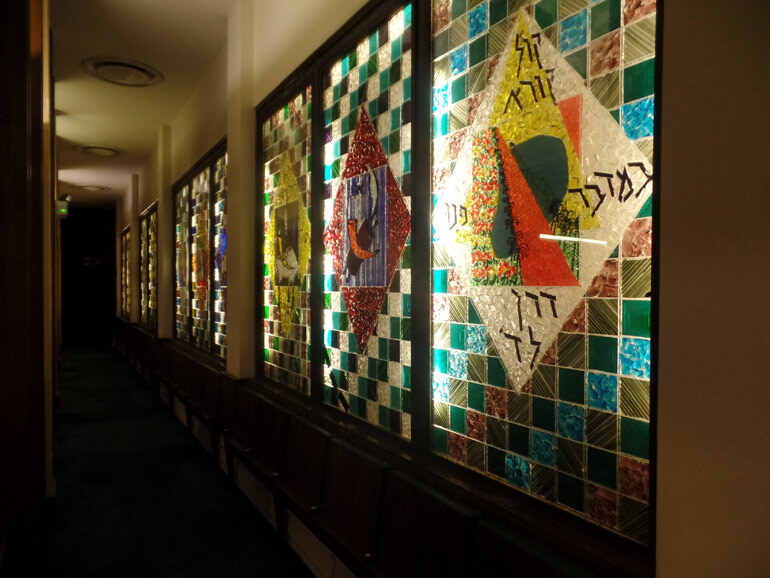 'JEWISH FESTIVALS': Set of 36 stained glass windows. Pergamon Press Headquarters, Oxford, UK. Cast aluminium articulated partition wall separating main sanctuary from baptismal chapel. All elements swivel. Sherman House Hotel, Chicago, USA. Re-sited to Dominican University (formerly Rosary College), River Forest, IL, USA in 1975, but subsequently demolished in 2008. Copper sculpture over main entrance. 3-dimensional optical effect painted aluminium wall. 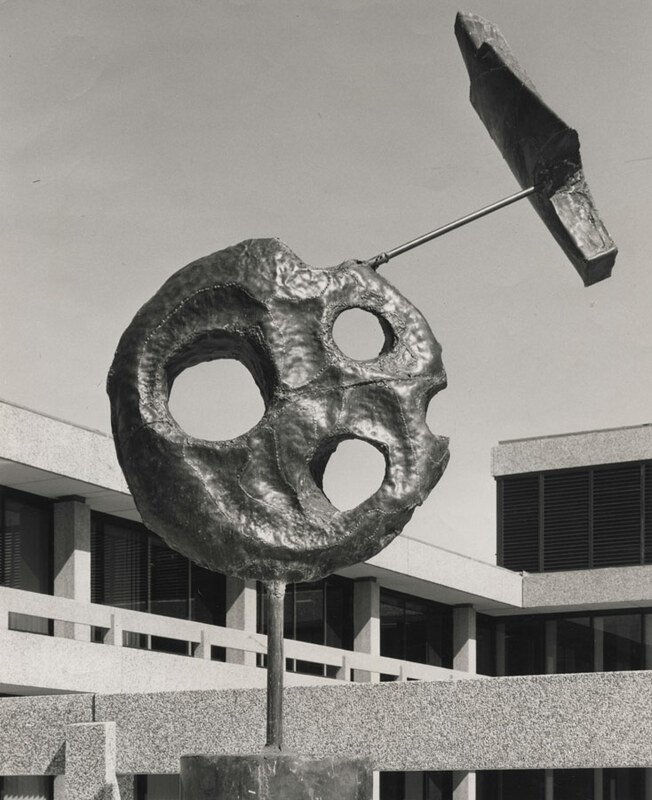 We would welcome information about the artwork's current location. Plaza Hotel, Tel-Aviv, Israel. Re-sited to Beit Ariela Library, Tel Aviv and, in 2015, to Rehabilitation Center, Chaim Sheba Medical Center, Tel Hashomer, Israel. 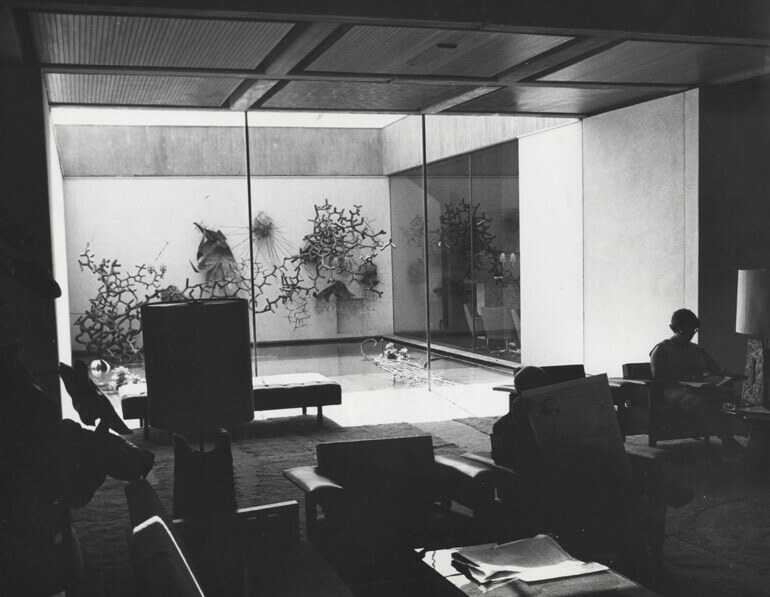 Hennig House Diamond Center, Ramat-Gan, Israel. 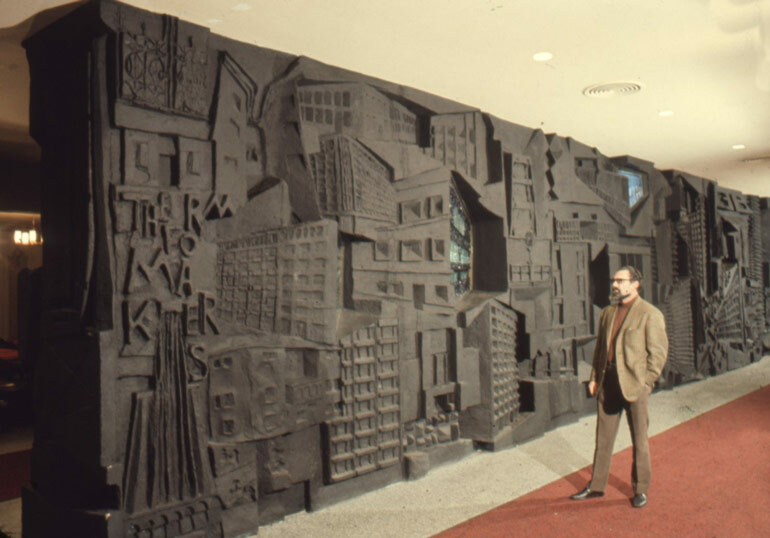 The artwork remains in its original location. 2 Fountains in the form of diamond crystals – at the entrance Perspex Sculpted in Wallingford and shipped to Israel. 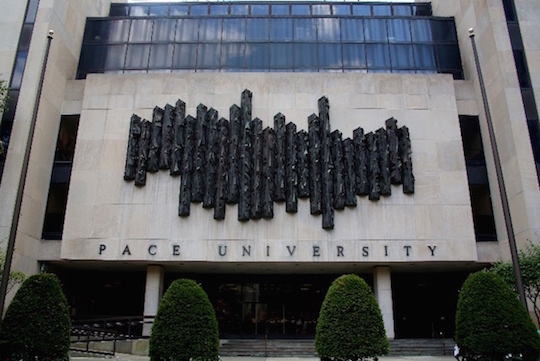 The artwork was demolished in 2013. 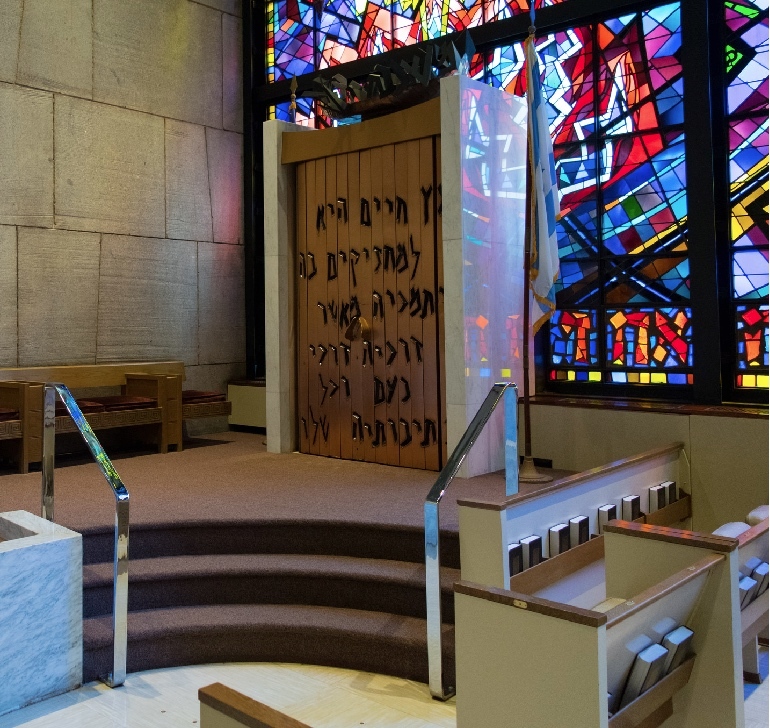 Image credit: Eric Revels, ERC Co.
Temple Sholom Synagogue, Chicago, IL, USA. 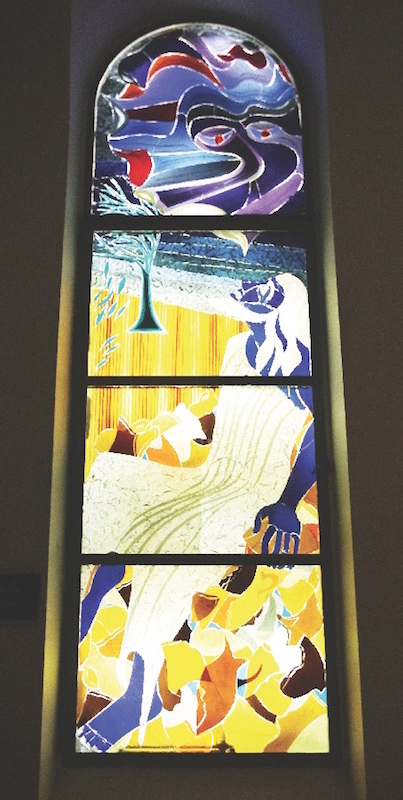 Set of five stained glass windows, which employ a layering technique for a three-dimensional effect and represent selections from Job, Proverbs, Psalms, Ezra and Nehemiah. 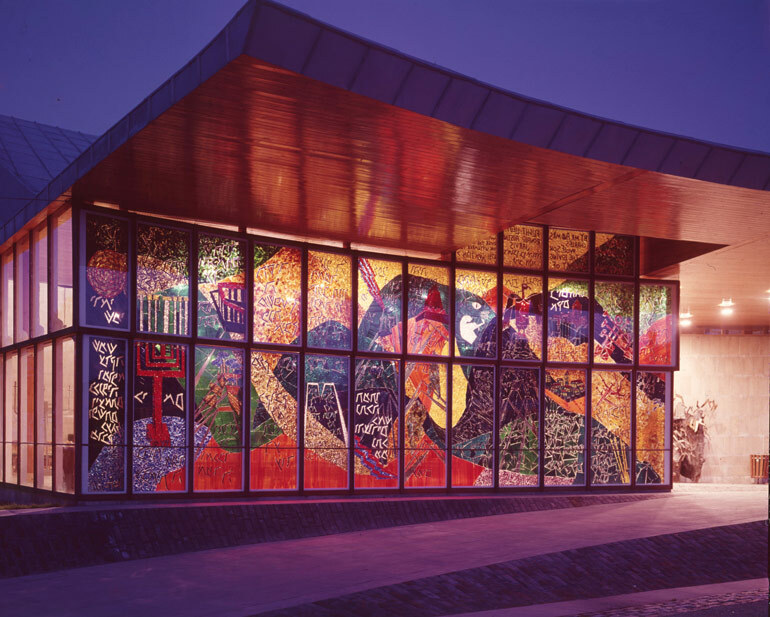 The artworks remain in their original location. 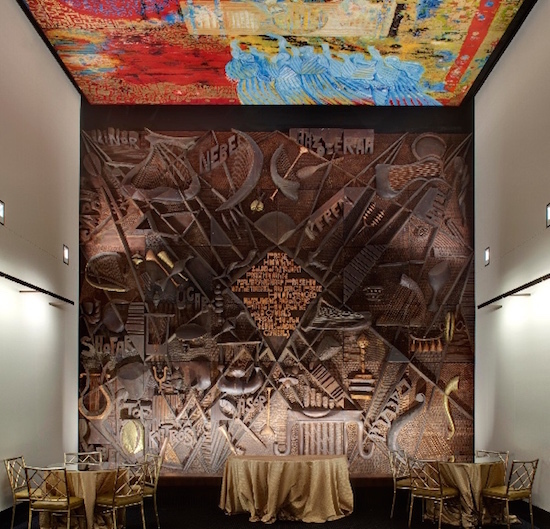 The Israel Lounge, The John F. Kennedy Center for the Performing Arts, Washington, D.C.
Brass sheet and wire partition wall 15'x39' (4.5 x 12 m). University of Warwick, Arts Building, UK. St Thomas' Hospital, London, UK. 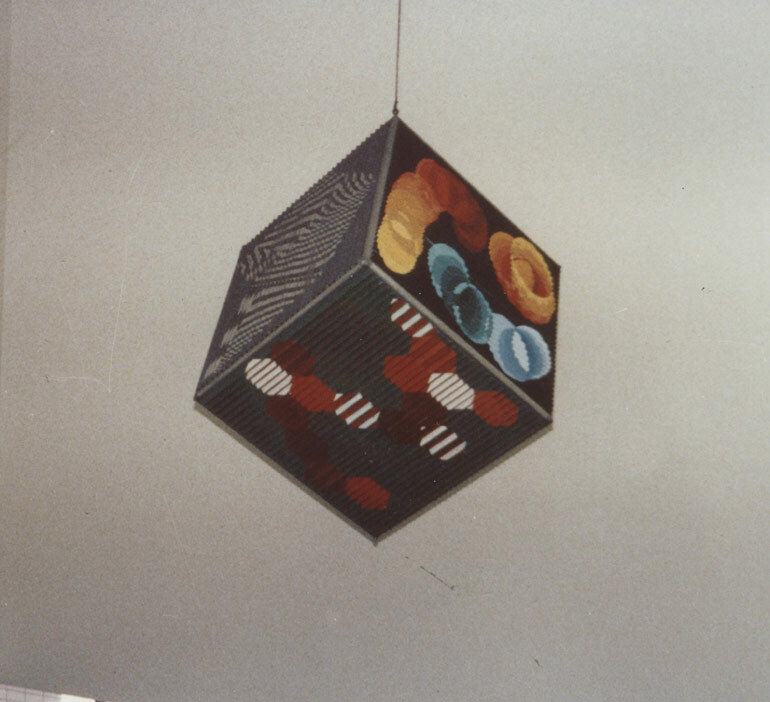 Optical mobile cube, ribbed metal 3'6 square ( 1 x 1 x 1 m). 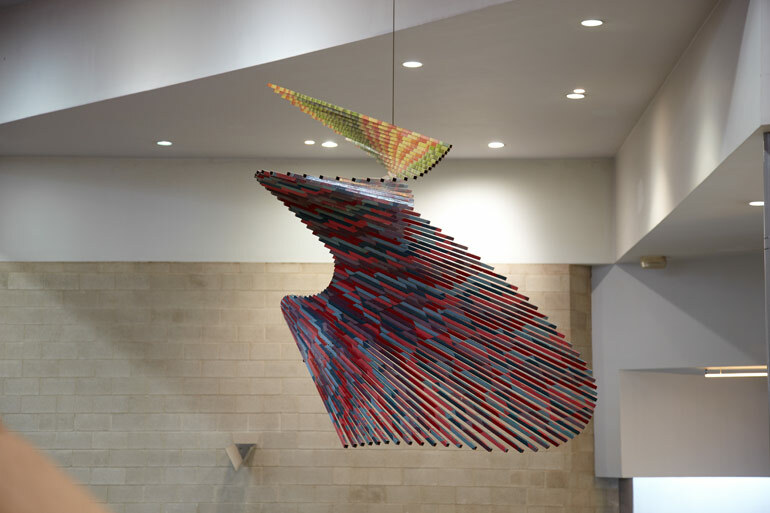 The artwork is in the art collection of Guy's and St Thomas' Charity. Imo Concorde Hotel, Owerri Nigeria. 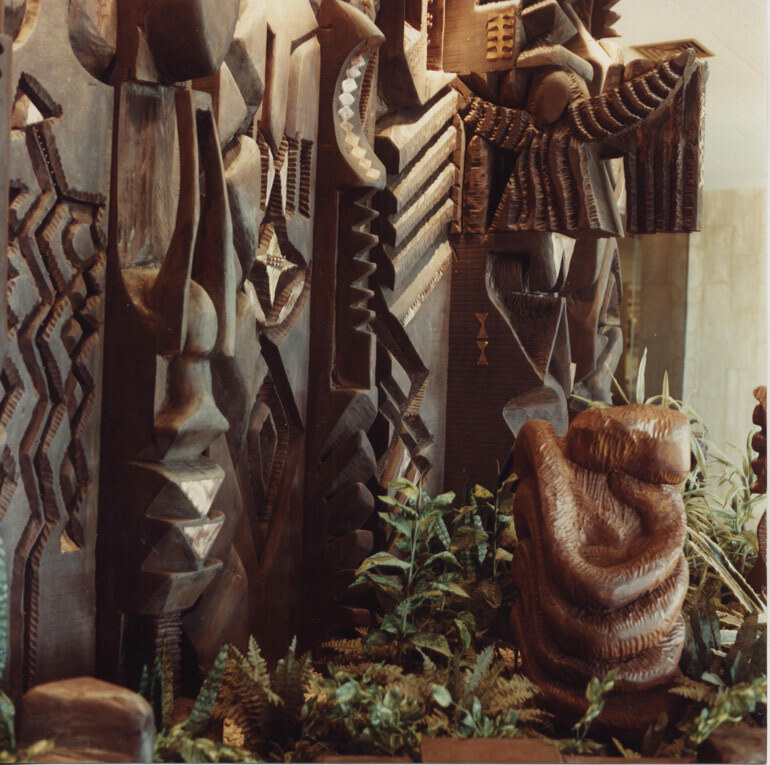 Carved wood wall with five free-standing wood sculptures. Sheba Medical Centre, Dining Hall, Tel-Hashomer, Israel. 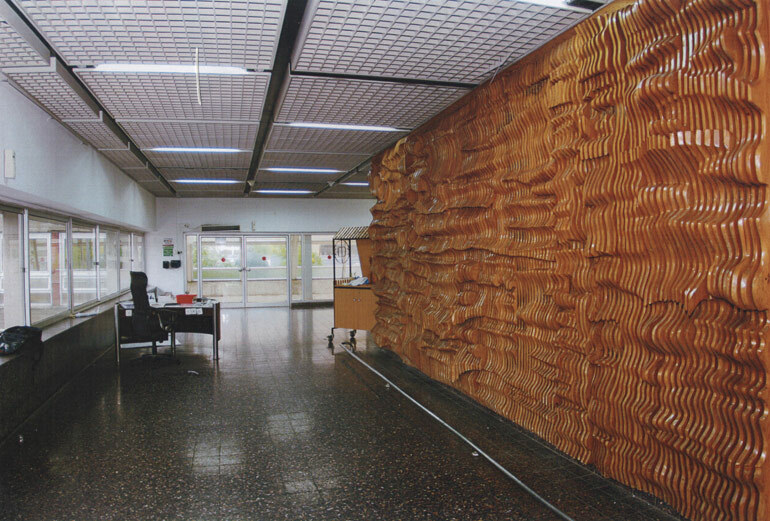 Op effect 3D carved wood wall Canadian pine, tinted with sands. 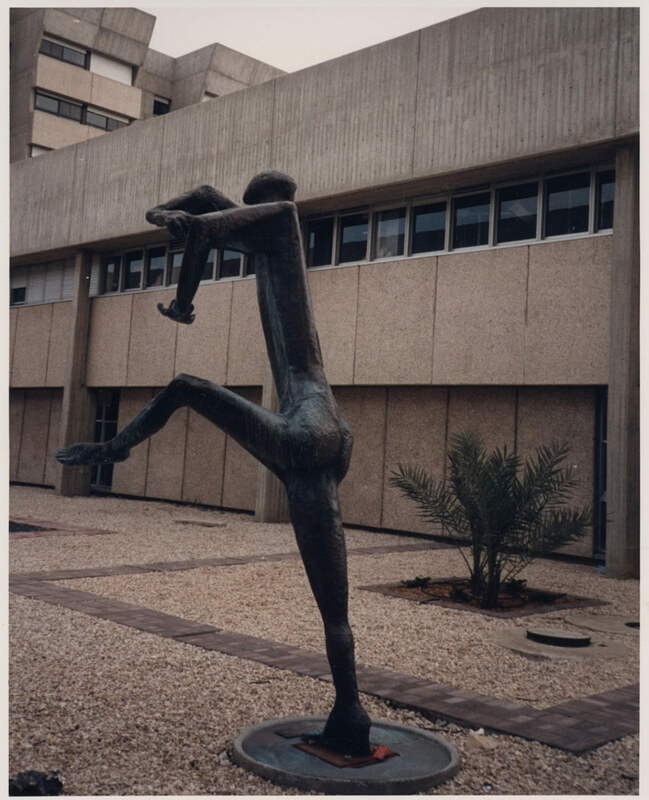 Sheba Medical Centre, Heart Institute, Tel-Hashomer, Israel. 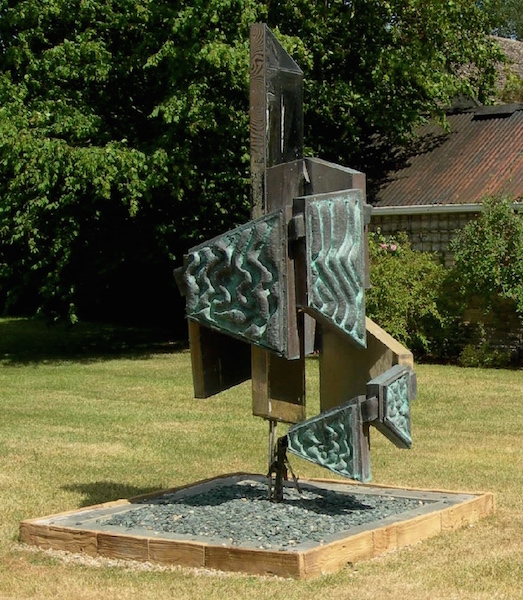 Free standing copper sheet and water sculpture. Churchill College, University of Cambridge, Cambridge, UK.